Bumble and bumble hairdressers needed an oil they couldn’t find elsewhere. Something clear and light, that worked sublimely on all hair types. Something that vanished into hair, leaving a feathersoft feel and a trace of shine. That worked on wet or dry, coarse or calm types, instantly – for a sensational finish. Hairdresser’s Invisible Oil was made to meet our hairdressers’ high–performance standards. 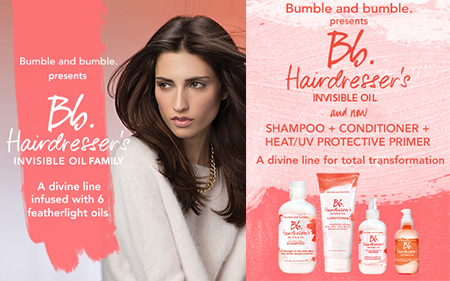 Hairdresser’s Invisible Oil is a transformative, lightweight, clear–as–day hair oil that works for all types of hair. It features a luxurious blend of oils and extracts to soften, tame flyaways and add shine. With UV filter, it helps maintain health of hair. Visit an About Faces location to purchase.